Something to think about: a group of international researchers found a correlation in Brazil between colon cancer and pesticides. Brazil is one of the largest pesticide users in the world, and annual pesticide use is still increasing - along with increases in colon cancer and colon cancer deaths, especially in agricultural areas. While the study was correlational (didn't prove that pesticides caused the cancer) - what supports the findings is that some other studies in both humans and rodents found that pesticides increase the risk of colon cancer. Many pesticides are considered carcinogenic (cancer-causing). The researchers pointed out that pesticides are contaminating water and food in Brazil, pesticide residues have been found in breast milk, pesticide residues in cow's milk exceed safety standards in some regions of Brazil, and 20% of food samples analyzed by one government agency between 2013 and 2015 were found to be unsafe for humans to eat due to high pesticide residue levels. One reason for recent big increases in pesticide used is from genetically modified crops - so that they are resistant to pesticides (herbicides) applied. Brazil’s rapid industrialization of its agricultural sector may be coming at the cost of resident health, according to a new study published in Chemosphere by an international team of scientists. The researchers link the rise in the country’s pesticide use since the turn of the century to significant increases in colon cancer, particularly in the country’s most intensive agricultural southern regions. Researchers note that as Brazil’s agriculture industry has grown over the last two decades, it has become the world’s leading consumer of pesticides. In the year 2000, roughly 160 million tons of pesticides were used in the country. By 2012, that number reached nearly 500 million tons. Scientists compared pesticides sold to standard mortality rates (SMR) in each Brazilian state. SMR measures mortality by comparing observed mortality to expected mortality when adjusting for age and gender. A rate above one indicates that there is excessive mortality. Despite improvements in detection and treatment, colon cancer deaths recorded in the country increased from roughly 950k in 2000 to over one million by 2012. Using a series of statistical models, researchers showed that as the amount of pesticide sold in the country increased, the SMR for colon cancer increased in close correlation. This trend held for both male and female populations. “The results show a strong link [between pesticides and colon cancer mortality] and as such cannot be ignored,” said study co-author Francis Martin, PhD, of the University of Central Lancashire’s School of Pharmacy and Biomedical Sciences in the United Kingdom to SciDevNet. 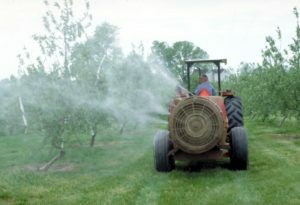 Beyond Pesticides’ Pesticide Induced Diseases Database lists a number studies linking agricultural pesticide use to colon cancer. Much of this research focuses on the risk to farmers and applicators, but residents can also be exposed to pesticides through drift, runoff into drinking water sources, and residues on food. Authors of the study are concerned with Brazilian government data showing that 20% of food sampled between 2013 and 2015 was considered unsafe due to high pesticide residue. Researchers indicate that their data reveal pesticide exposure to be a potential risk factor for colon cancer, and indicate their correlational findings warrant further investigation. As a result of increasing attention to pesticide dangers, earlier this year a Brazilian judge ordered a suspension of glyphosate, the most widely used herbicide in the world. Reports from other South American countries such as Argentina indicate that there is widespread poisoning arising from the increasing use of genetically engineered crops developed to tolerate repeated sprayings of glyphosate and other pesticides.